Roofers bitumous operation build or repair flat roofs, for example using hot asphalt, gravel and waterproof sheet materials. Clear roof and inspect for irregularities and damage. Remove or demolish (parts of) the roof construction, such as existing covering and old layers. 7. Apply layers of insulation and waterproofing / waterproofing systems to the roof surface. 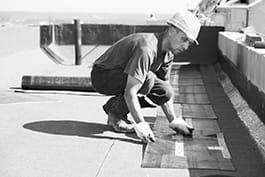 Apply reinforced bitumen membranes (RBMs) in hot bitumen, lay hot mastic asphalt, synthetic membranes or related materials to the roof surface using techniques including bonding, torching, spreading, and sealing of laps'. Install roof details, such as roof windows and pipes. Finish off the roof, e.g. by applying a ballast layer of gravel or pebbles. Conduct periodic maintenance of flat roofs.